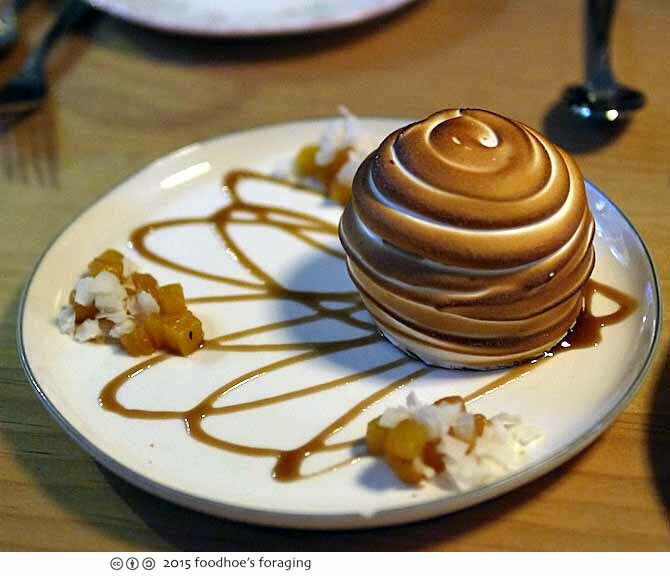 For several years I have been hearing about amazing popup meals that chef Ravi Kapur’s liholiho yacht club was serving around town and started following them on Twitter and Instagram. I finally went to their restaurant, which opened up last year after my fine friend Brenda of Bites & Bourbon dedicated some time to make the reservations a month in advance. 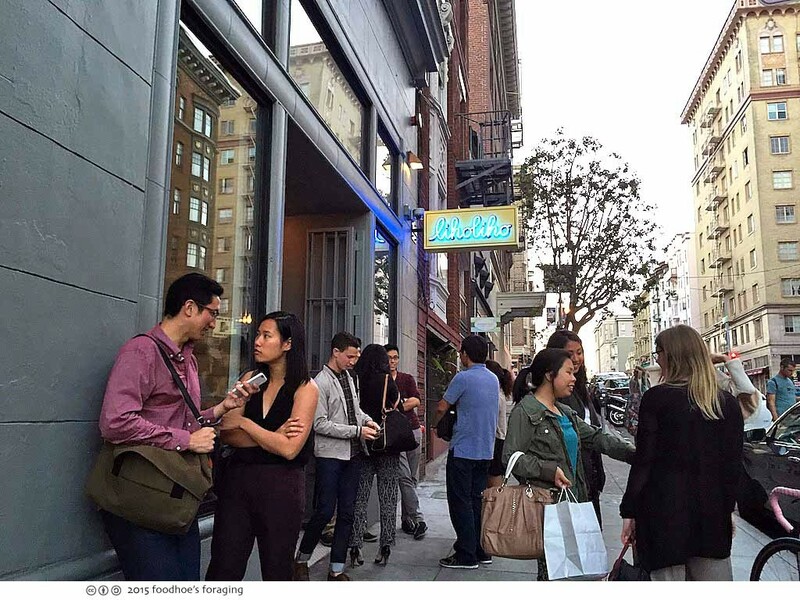 You can see from the line outside, this place is popular! 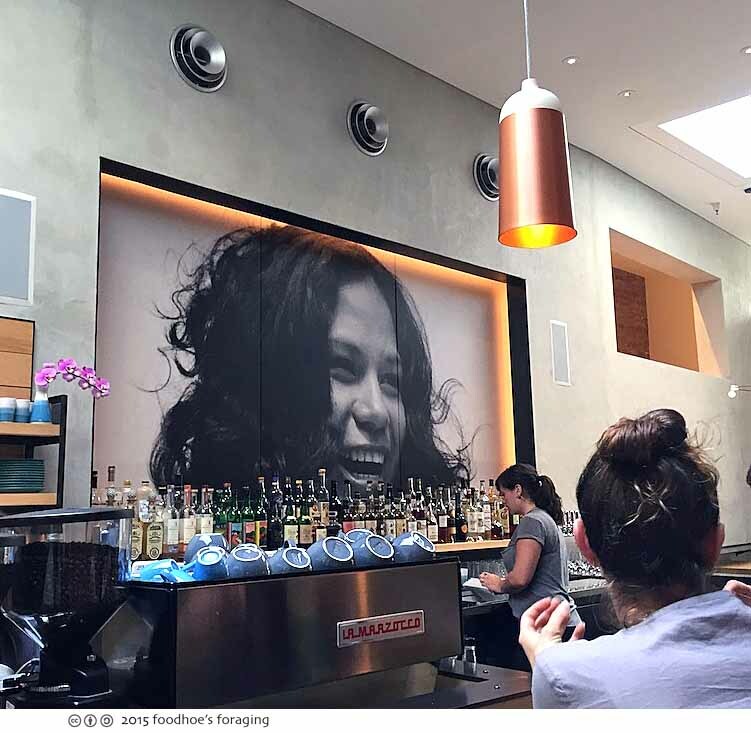 As usual I arrived early and found Paula sitting in the bar across from the wonderful vintage photo of Chef Kapur’s mother that fills the room with her warm and infectious smile. We were soon joined by Brenda and her friend Laquel of Kid Free Travel. 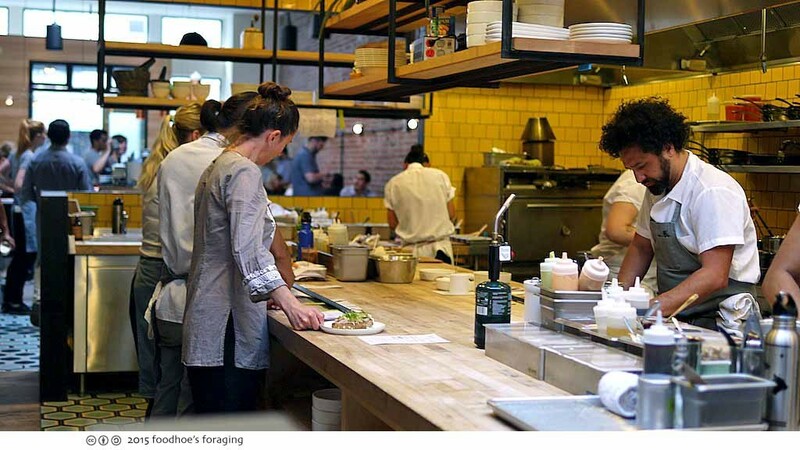 Much has been written about Chef Ravi Kapur, who is a partner in the restaurant that honors his Hawaiian heritage, you can read an article from the local SF Chronicle here. You probably just want to read about the food anyways, am I right? The menu is a celebration of Hawaiian influenced flavors using local ingredients and has all kinds of family-style plates that are meant to be shared. The open kitchen is in between the bar and the dining room, Chef Kapur is on the right with his trademark fabulous crown of curly hair. The walls are lined with bright yellow tiles that create a warm and friendly glow. The menu fits on a single page, with snacks, small plates and entrees that are so large you really have to share. We asked our server for recommendations and we loved every dish that we ordered! She said that we needed two orders of the Tuna Poke ($5.50), because it is so good that everyone will want to have their own. 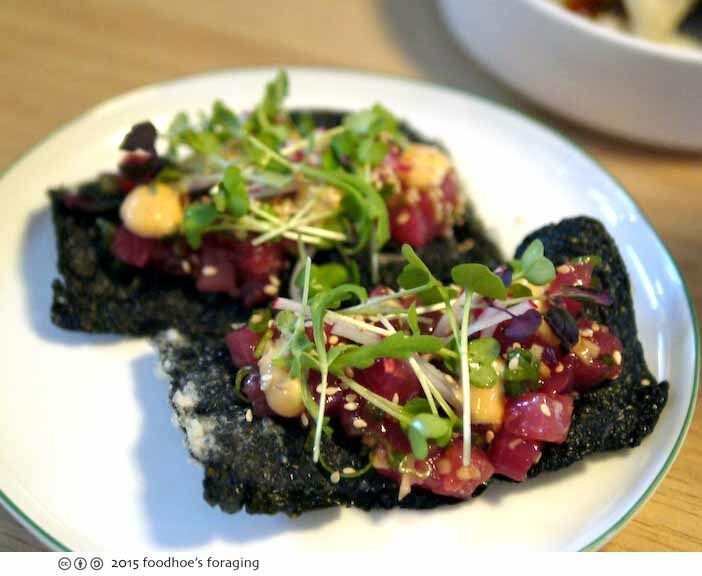 Each plate had two crisp crackers made from paper thin sheets of toasted seaweed that have been lightly battered and fried to a crisp, then piled with a mixture of raw tuna, sesame oil, topped with pungent crisp radish slivers, daikon sprouts and a rich, and drizzled with a spicy rich sauce. 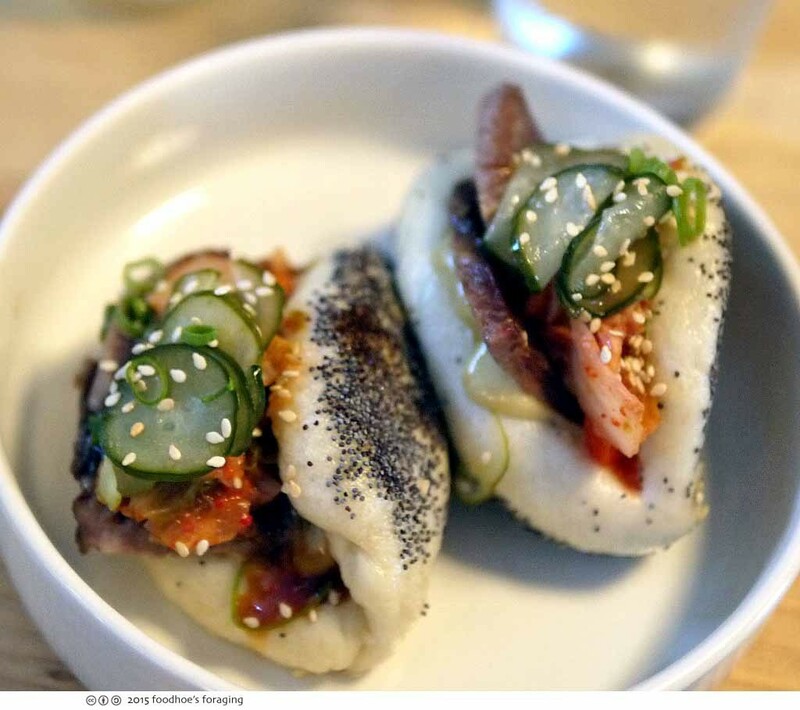 We split the next plate of fluffy steamed buns filled with beef tongue, kimchi, cucumber ($12.50). The poppy seeds added a delicious nutty crunch to the pillowy soft bread which surrounded the thick slices of luscious meat drizzled with a sweet and savory sauce. We loved each bite, the ratio of meat to bun was balanced with paper thin slices of sweet-sour cucumber, garlicky kimchi and rich spicy mayonnaise. Brenda and I had been drooling over photos of their house-made spam on their Instagram feed, which is not on the menu and limited to 20 servings a night. 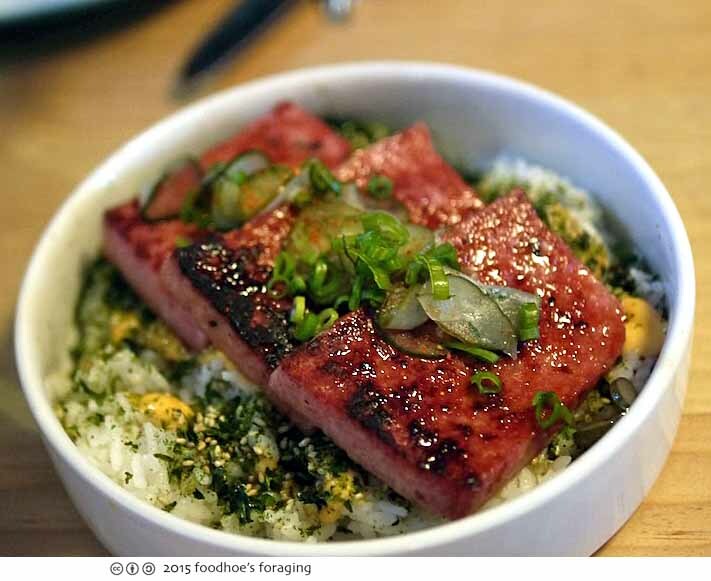 Their spam takes three days to make, then it is sliced, grilled in a tamari, brown sugar and sesame oil glaze to a delectable and caramelized crisp, and served over rice that has been sprinkled with furikake and drizzled with spicy mayo, then pickled cucumber and minced scallions are strewn over the spam. It was simple and wonderful, comfort food at its best. 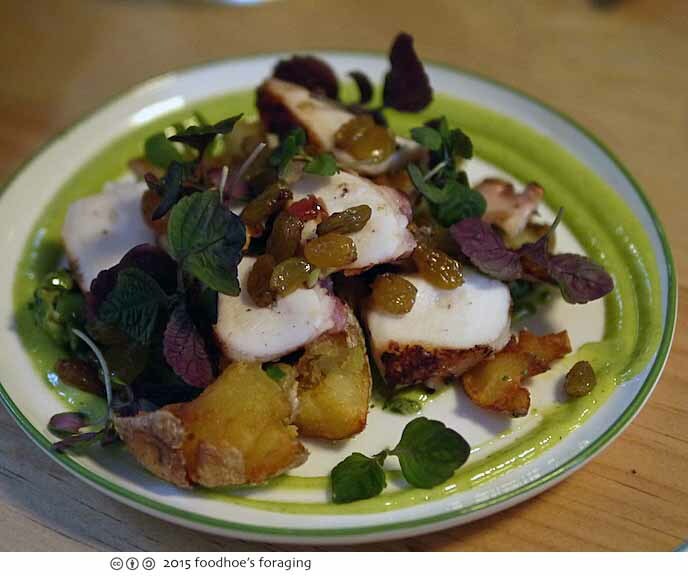 Our last small plate was slices of roasted octopus, curried raisins, castlevetrano olives, butterball potatoes, purple shiso ($16.75). The octopus had a fine meaty texture, the castlevetrano olives were buttery, the potatoes had an excellent crisp crunchy crust and were tender and fluffy inside, the sweet plump raisins were infused with the tastebud tantalizing flavor of curry and the plate was ringed with an herby creamy sauce that brought the flavors together. The entrees were huge! 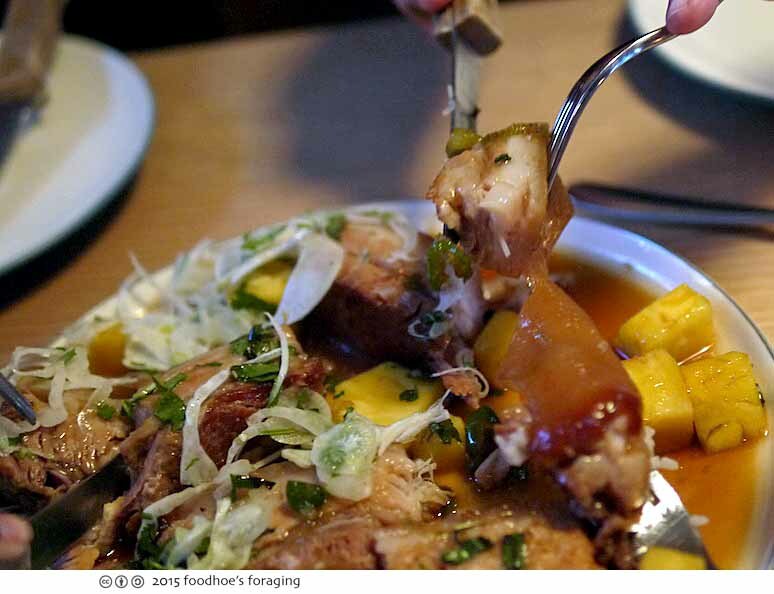 I’m pretty sure that one person could not finish the plate… We swooned over the Caramelized and twice cooked pork belly, topped with pineapple, thai basil, fennel $29.50. The pork is slow cooked over two days, which renders the meat incredibly tender, the layers of fat are like rich pork custard, the skin is gelatinous and tender, which combine well with the paper thin slices of peppery fennel and juicy and sweet chunks of pineapple, each bite is so full of wondrous textures and mouthwatering flavors. 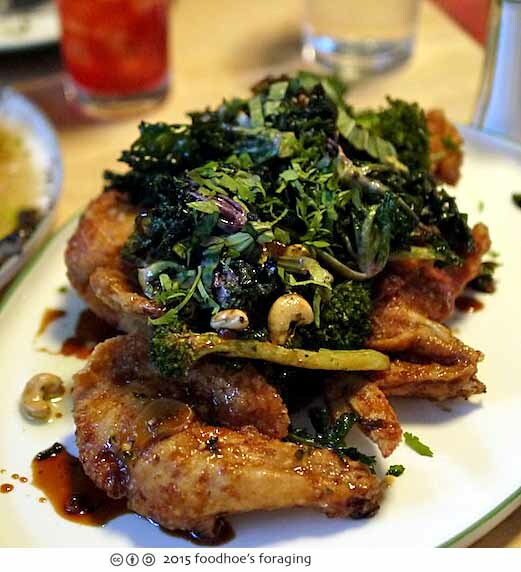 The fried cornish game hen, cashews, tamari glaze, flowering kale ($34.25) provided each of us with a surprisingly generous portion. The tangle of crisp fried vegetables was coated with an addictively sweet & savory gloss that Paula said was like candy. The skin of the bird been fried to a gorgeous crunchy crust that the addictive tamari glaze clung to, making us want to take bite after bite even after we began to feel full. 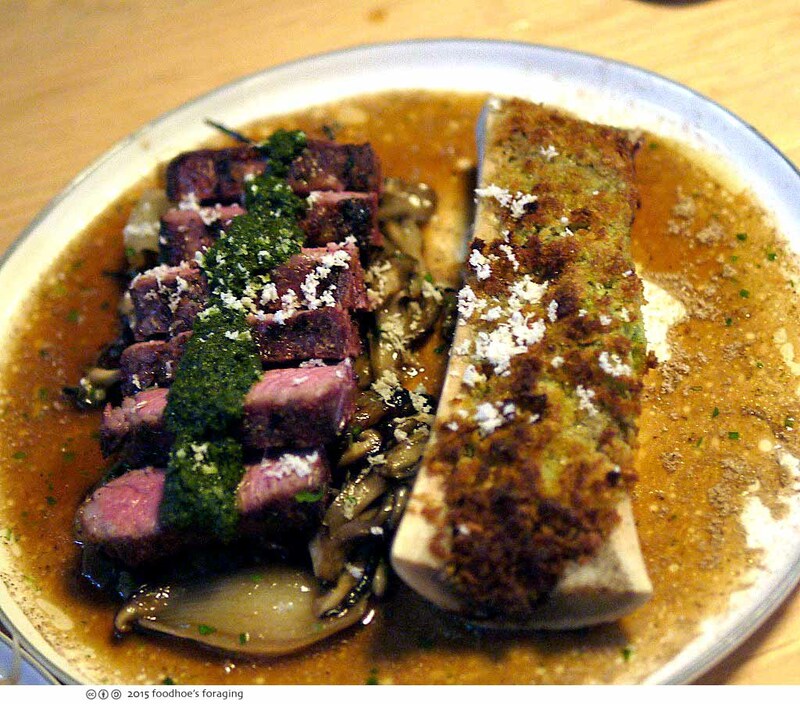 The grilled shortrib, was accompanied with escargot topped bone marrow, mushrooms, spring onions, fresh horseradish ($36.75). Wow, escargot in the bone marrow! And the texture of the meat was so tender and succulent, it was delicious with the velvety mushrooms and the rich flavorful sauce. 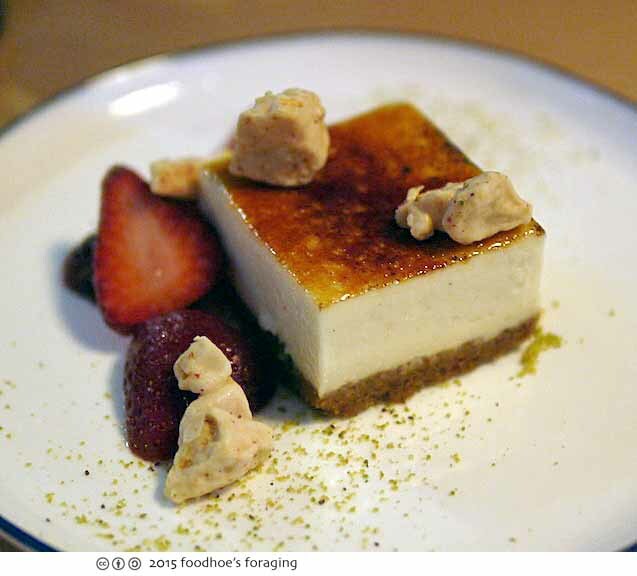 Honestly, by the time I got to the bruleed cardamom cheesecake ($10), with grated pistachio, strawberries and decadently crunchy bits of honeycomb, I took a tiny bite and was done. I was on the verge of channeling Mr. Creosote, and decided for the safety of everyone to just stop. Sometimes you have to listen to your body. it was really good, there was not a single weak dish that we ordered! I’d go back in a heartbeat, let me know if you need additional dining partners! Some friends mentioned this place to me. I’ll have to check them out. what luxurious food! the desserts look amazing–a baked hawaii is a great idea! I AM SO JEALOUS THAT YOU GOT TO EAT HERE. I’ve been DYING to go, honestly so I can devour those desserts! Cheesecake is my favorite and hardly any restaurants serve it. YES. The escargot with bone marrow… It’s all coming back to me – really delicious food. Let’s go back!